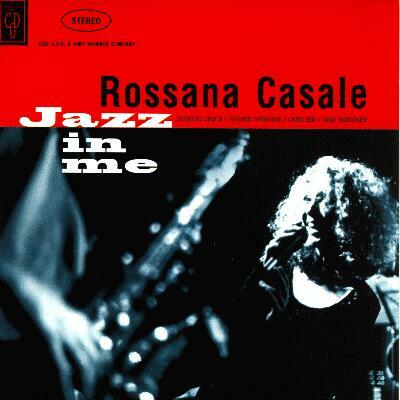 Rossana Casale - "Jazz in me"
Let me continue proposing you quite unusual records for your HiFi system (and record collection!). This is the time...to remember (thanks, Billy :-)): this recording is _exactly_ 10 years old (June 1994!). Now, who is Rossana Casale??? Of course, as you can easily guess, she is an Italian singer, quite popular in Italy as a commercially-oriented light-pop artist. For sure, her name isn't the first one that comes to mind when thinking of Italian female jazz singers. Instead, Rossana has always been very fond of Jazz Music, actually this is her "one and only love". Hence, in parallel with her Pop singer carreer, she has published at least three albums dedicated to jazz classics. The first one in the row is this "Jazz in me" I'm about to tell you something, then "Jacques Brel in me" and finally (2003) "Billie Holiday in me". Album titles are self-explanatory. Jazz in me is a collection of 11 evergreen classics. Among others, let me cite Every time we say goodbye by Porter, Don't explain by Holiday, How long has this been going on, Summertime, But not for me by Gershwin, My funny Valentine by Rodgers & Heart etc. She doesn't even dare to claim she is a REAL jazz singer. Rather, she just wants to sing the Music she loves most everytime she can. Since Rossana likes doing things well, she chose a very good quartet of Italian jazz artists: Riccardo Zegna (piano), Luciano Milanese (bass), Carlo Atti (Sax) and Luigi Bonafede (drums) plus a pletora of other distinguished colleagues. Rossana Casale's voice is very particular: perhaps not exactly well suited for jazz singing (too high pitched) it crawls through the notes smoothly and gently: just imagine a sheet of white, light velvet that caresses your skin. She sings with the heart, undoubtedly! One thing's for sure: she and the quartet have fun while playing, it seems they are in front of a group of close friends instead of a cold recording studio. This suspect is confirmed by the recording notes: this album has been recorded direct in just 4 days, no additional mixing or manipulations of sorts. And this is the reason why I decided to include it into our section of "good recordings" for our HiFi systems. Though not being close to the best Chesky or Reference Recording discs, this "Jazz in me" is amazing, mainly because it sounds fresh and real. Not "perfect", for sure, but very, very natural. Bass and drums are very good and so is the piano, clean and percussive when needed (e.g. Good morning heartache), placed in the right place just behind the band. The voice is good, though perhaps not always 100% clean. Sometimes a bit closely miked it lacks that magic touch one can find on the best recordings. Don't forget this is NOT an audiophile disc made to "impress": just a simple direct recording that aims to capture the true spirit of the event: a groups of friends in Love with Jazz having fun! In My one and only love the sax solo is breath-taking: clean, perfectly focused and dynamic. It is clear it has been "taken" inside a recording studio, since the reverbs and the echoes of the hall are extremely "short", damped and controlled. To get an idea of the atmosphere the band creates just listen to Blue Monk (by T. Monk)...pure human electricity and 101% fun! The virtual stage, considering the studio recording, is very good: precise, quite wide and deep. instruments are rightly placed and stable. Listen to the bass-voice duet in My funny Valentine: the bass notes appear always clean and well articulated, very rich in harmonic content. The voice is realistic, just a bit "dry" from time to time (wrong mic?). Don't expect walls-shaking bass or a larger than life soundstage...this is not a jaw-dropping record. It is just a clean, natural recording that gives you a (good) taste of the real event. Listen without prejudice! If you're serious about jazz, perhaps you'll find this album a bit far from the high standards you're used to. Rossana doesn't even want to be compared to those great jazz singers...she just wants to share with you her love for Jazz Music, creating an album that sounds fresh and entertaining. If you're not a jazz fan - an absolute beginner perhaps - this is one of the discs to start with: easy, fresh and...nicely recorded. At 5 € this is an absolute bargain.